Looking for hotels near Place de la Contrescarpe? Located in the 5th district, this property is set in the heart of Paris, just a 10-minute walk from the Luxembourg Gardens. Located in Paris, Le 66 provides accommodations within a 15-minute walk of Luxembourg Gardens. Free WiFi is available. A continental breakfast is served at the property. First opened in May 2017, CitizenM Paris La Défense offers luxurious accommodations with large living rooms, meeting spaces and a 24-hour fully stocked bar. I like that the eggs were cooked through and were not in an almost liquid state. Just 656 feet from the famous Champs Elysées and 1312 feet from the Arc de Triomphe, Hotel Ekta is located in Paris and offers free WiFi access throughout. Great location - awesome staff. Ask for FOAD - the front desk manager. Idol Hotel is located in Paris, 328 feet from Saint-Lazare Train Station, a 15-minute walk from Galeries Lafayette. The hotel is inspired by groovy and funky music from the 60s to the 80s. This hotel is great. As fans of classic rock, we loved the overall theme. Located 0.6 mi from the Eiffel Tower, Hôtel Eiffel Turenne features a bar, free WiFi in the public areas and a 24-hour reception. The staff was so helpful. A lovely place for travelers to rest their weary heads! The luxurious Hôtel Regina Louver is located in the heart of Paris in the fashion, shopping and museum district, overlooking the Louver. Great hotel. Great location...very helpful staff. Hotel Opéra Richepanse is a boutique hotel in central Paris, a 5-minute walk from Place de la Concorde and the Champs Elysées. The luxury shops on rue Saint-Honoré are 164 feet away. Very friendly staff ! Very family friendly hotel ! 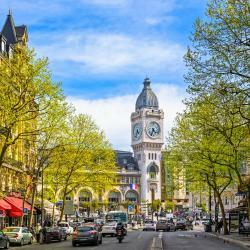 Hotels with great access to Place de la Contrescarpe! The hotel d'Orsay is located in a 18th-century building and set on Paris left bank. It offers air-conditioned accommodations,525 feet from the Orsay Museum. Great comfort in all facilities. Only one drawback - windows didn't open in breakfast room. Located near the Sorbonne University on Paris’ chic left bank, this 4-star hotel offers luxury rooms with period furniture and painted ceilings. Location was amazing. The accommodation itself was beautiful and very clean. A must-have visit for fans of Ernest Hemingway, he spent some Paris years in an apartment in the 5th arrondissement with his Paris wife nearby around Cardinal Lemoine. Nice area renovated in 2017 with restaurants and not far from parks or Saint Germain. If you go here you should absolutely go see the small, beautiful chirch Saint-Étienne-du-Mont, not least of you're a fan of Woody Allen's film Midnight in Paris in which Owen Wilson sits on the stairs of this church as suddenly a 1920's limo with Hemingway comes by.